As a complement to last Thursday’s meditation on the sigh at the heart of the “Hail Holy Queen” (Salve Regina), today let us consider the prayer’s portrayal of Mary. We can learn much about her, both as our advocate and as our mother, by leaning on these beautiful words. The final sighs are perhaps the most telling. Just as the whole prayer revolves around sighing for the sight of Jesus, so the ending has the three beautiful “oh’s”: “O clement, o loving, o sweet virgin Mary! Pray for us!” The final word to Mary is nothing but that sigh. And yet the sigh is couched about with descriptors, and they are very rich. First, “o clement.” Clement is not a word we use much anymore. The only place I can think of is that when a Governor takes someone off death row, it’s called “clemency,” I think. That’s not a bad place, though, to look for the meaning of the word. In Latin, clementia means not punishing someone even when they deserve it. To appeal to Mary’s clemency is to say we do not deny that we sin, do not claim that God owes it to us to let us see Jesus. To the contrary, we acknowledge that we are “children of Eve,” caught up in this world of sin. But neither do we grovel. The way the Salve Regina speaks of sin is as an exile, and it begs for help. Get me out of here! Not out of this world, but out of my sin. Help! Consider not what I deserve: just love me. The central word for Mary in the Salve Regina is “mercy.” “Hail, Holy Queen, Mother of Mercy . . . turn then thine eyes of mercy toward us.” Mother of Mercy, I think, is about the hardest phrase imaginable in Catholic theology. What does it mean to call Mary “Mother of Mercy”? She is merciful – but even more, Mercy himself is her Son. We need to lean into this, to think hard about what it means that Mercy himself came that close to us. But we need also to tread lightly, lest we flatten the mystery. The Salve Regina is a gentle meditation on Mary’s involvement in the Mercy of Jesus. We see her first as the clement mother, she who does not punish. But then the prayer takes us a step further: “O loving.” The word in Latin is pia. It’s one of the most fabulous ideas in the Latin mind . . . but we just don’t have it in English. 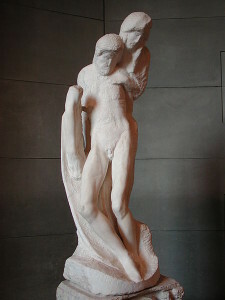 Pietas does not mean pity, nor does it mean piety – though in a moment perhaps you will see how it is related to both. Pietas is “family feeling.” It means treating your father like your father, your mother like your mother, your son or daughter like your own child. In a technical definition, St. Thomas says it is justice as it relates to family. I’m not going to try to unravel that, except to say, we need not be unjust to other people in order to recognize that our family has special claims on us, deserves a special something. In fact, we would undermine the deepest meaning of justice as right relation if we didn’t embrace those family relationships. In Michelangelo’s Pietà, that’s what Mary is experiencing . . . .
We take, then, a step deeper in our understanding of the Mother of Mercy when we say she is not just clement, she is pia. Indeed, she is clement because she is pia: we are spared punishment, given another chance, because we are family. We needn’t say Mary is our mother to say that, when we stand beside her at the Cross of Christ, we become family, and we gain a special affection. Indeed, this is the deepest meaning of calling Mary mother. And so, in fact, the prayer takes a step further. To be truly pia is not only to be clement, but to be sweet. A loving mother, or sister, or any kind of family member goes far beyond just sparing punishment. A loving family is sweet to one another, helps one another. This is the deepest meaning of mercy: not just clemency, but sweetness, because of pietas. That is why Mary is our life, our sweetness, and our hope: because she bespeaks the mystery of Jesus becoming family. Mother and mercy are intimately intertwined. A mother is merciful – sweetly merciful, not just sparing but praying for us, and keeping her eye on us. And when Mercy himself takes our sister as his mother, the sweetness truly reaches to the depths of God. 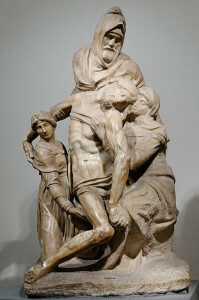 How do you experience, and live pietas: with Jesus, with your own family, and with Jesus’s family? this post made me love Mary more…saw her in a different light…brings me back to my Marian years in school…bringing her flowers in May…praying my novena to our Lady…thanks and God bless. What a beautiful explanation. I really loved the portrayal of family, the discussion on Pietas, and the deepness of Mary’s love becomes more relateable.